FOR THE CHICKEN AND SAUCE: adjust oven rack to middle position and heat oven to 350 degrees. Combine chicken and broth in large saucepan, cover, and simmer over medium heat until breasts register 160 degrees and/ or thighs register 175 degrees, 8 to 12 minutes. Remove chicken from pot and pour liquid into measuring cup. Let chicken cool slightly, and then shred into bite size pieces. Wipe pot dry, add butter, an melt over medium heat. Add onion an cook until softened, 5 to 7 minutes. Stir in garlic and cook until fragrant, about 30 seconds. Stir in flour and cook for 1 minute. Slowly whisk in white wine and simmer until nearly evaporated, about 30 seconds. Gradually whisk in reserved broth and cream. Stir in bay leaves and nutmeg and simmer, whisking often, until sauce is thickened and measures about 10 minutes. Off heat, remove bay leaves. Whisk in Parmesan and basil and season with salt and pepper to taste. Cover sauce to keep warm; set aside. FOR THE FILLING AND NOODLES: in large bowl, combine goat cheese mozzarella, ½ cup Parmesan, egg, lemon zest, lemon juice, garlic, ½ teaspoon salt, and ½ teaspoon pepper until uniform. Gradually stir ½ cup of sauce into cheese mixture, and then fold in shredded chicken, ½ cup basil, and olives; set aside. Pour 1 inch of boiling water into 13 by 9 inch broiler safe baking dish and slip noodles into water, 1 at a time. Let noodles soak until pliable, about 5 minutes, separating noodles with knife to prevent sticking. Remove noodles from water and place in single layer on kitchen towels; discard water and dry baking dish. Cover dish tightly with aluminum foil that has been sprayed with vegetable oil spray. Bake until edges are just bubbling, 25 to 30 minutes, rotating pan halfway through baking. Remove baking dish from oven. Adjust oven rack 6 inches from broiler element and heat broiler. Remove foil from dish, sprinkle with remaining ½ cup parmesan, and broil until top is spotty brown, 4 to 6 minutes. 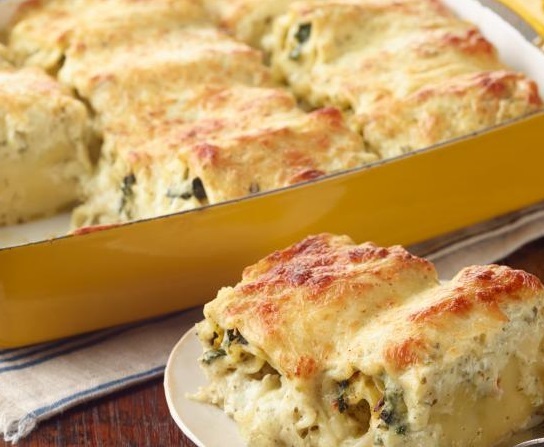 Let casserole cool for 10 minutes, and then sprinkle with remaining 2 tablespoon basil and serve. End. Using a spoon mound the chicken cheese mixture over the bottom of each noodle, then compact the filling into a log. Roll the noodle up and around the filling, then lay the roll up, seam side down, in a baking dish. End.